Please, please, PLEASE don't let this film be another white savior story. 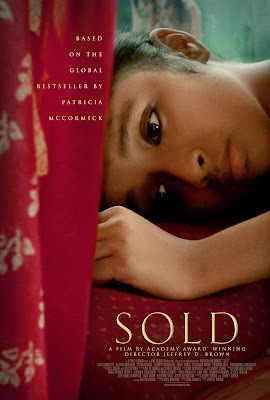 That's the only thing I see as a possible red flag after reading about SOLD, the upcoming film that tells the story of a 13-year-old girl who is abducted and trafficked across the Nepal-India border. Because it's so rare that we get to have a film released in America with a young brown girl as the protagonist and featured on the movie poster; to think that her narrative might be usurped by the heroic arcs of characters played by Gillian Anderson and David Arquette would be too unfortunate for words. A young girl, Lakshmi, leaves her home in a quiet village in the Nepali Himalayas in the expectation of a job in big city India. However, upon her arrival in Kolkata, she soon realizes she has been trafficked into a prison brothel, where she must struggle daily to survive against impossible odds. A US photographer (Gillian Anderson) hears her cries for help and works with an NGO, to spearhead a dangerous mission to rescue her. Finally, Lakshmi must risk everything for freedom. SOLD is a testament to the resilience of the human spirit and a clarion call to action. I'm not sure what role David Arquette plays in the story, but the fact that he's in this kind of film at all is...interesting. But I am really, really intrigued by the story so far. Plus, anytime we get to see Agent Scully on the big screen is a good day--white savior aside. Anyone here read McCormick's book? I'd love to hear some sight as the trailer was a bit broad. Share your thoughts in the comments section. SOLD will open nationwide on April 1.